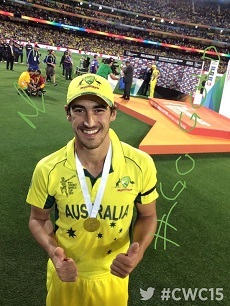 Paceman Mitchell Starc has been named the 2015 Cricket World Cup player of the tournament after taking his 21st and 22nd wickets of the tournament to play a leading hand in Australia’s fifth World Cup triumph. Mitchell beat out the likes of fellow paceman Trent Boult and Sri Lankan legend Kumar Sangakkara for the top honour, finishing the tournament with an incredible average of 10.18, economy rate of 3.50, strike rate of 17.40 and a record of taking at least two wickets in each of Australia’s eight matches. The left-armer’s performances this summer have also catapulted him to the top of the world ODI bowling rankings for the first time of his career. Mitchell took 2-20 from eight overs in the final – including the key wicket of New Zealand skipper Brendon McCullum in the match’s opening over – to again figure as an instrumental factor in his side’s success. The 25-year-old delivered his most devastating performance of the tournament in Australia’s one defeat of the campaign, also against New Zealand, during the pool stages when he ripped through the Black Caps order to claim 6-28. “I’ve worked really hard at it for a number of months, a few series ago I sat down with Craig McDermott and worked out a little plan. To see it all come to fruition tonight and through the whole tournament really has been phenomenal.” Mitchell said. Mitchell is currently nursing a small knee niggle and will depart for India in a couple of weeks to link up with Royal Challengers Bangalore for IPL8 in India. He joins fellow Aussie’s Sean Abbott and Nic Maddinson at the franchise alongside other International super stars such as Virat Kohli, AD De Villiers and Chris Gayle.